Your competitors are using the same PPC tools and strategies as you are. To gain a substantial competitive advantage, you need a way to pull ahead of the pack. Sisense is your secret weapon to win the PPC war! With Sisense, you will discover PPC strategies which will increase click-throughs and conversions while significantly lowering cost-per-click and cost-per-conversion. 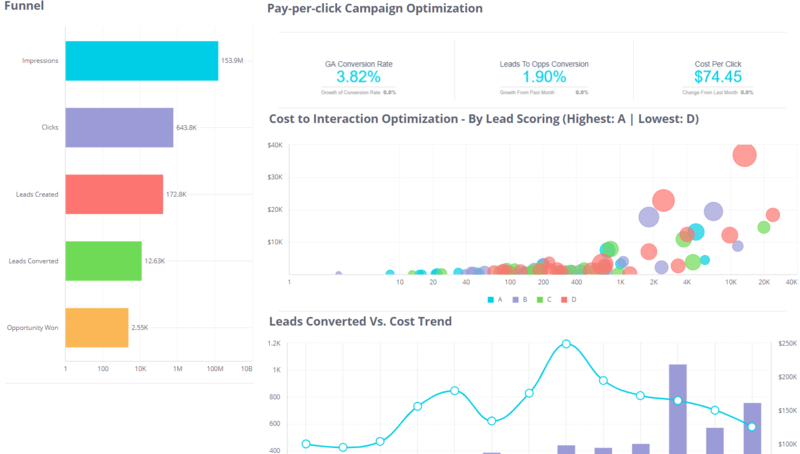 While Sisense comes with unique, ready-to-use PPC optimization dashboard reports (just enter your Google AdWords account login and Sisense will do the rest), the beauty of Sisense is how easy it makes it to customize reports and create new ones. With Sisense BI and dashboard software, your marketing creativity and ingenuity will find an environment ripe with opportunities to develop and extend an impressive competitive advantage. Easily mash up data from multiple data sources (e.g., Google AdWords, Google Analytics, your on-premises or cloud CRM, in-house operational databases) and create queries, reports and dashboards with unlimited flexibility. Update data sources at any time. There is no need for a separate data warehouse, pre-aggregations, pre-calculations, or OLAP cubes. Immediately run complex, ad hoc queries on any amount of data from any number of sources. And easily share your reports and dashboards with any number of other users via the Web. The following PPC optimization reports and dashboards are included with Sisense and are ready for use (just enter your Google AdWords account login to get started). However, they are really just starting points for you to customize and create your own, unique queries and analytics! Be prepared to exercise your marketing creativity to create new and original analytics to discover the “unknown unknowns” lurking in your data, and gain tremendous competitive advantage with PPC intelligence that no one else will have. It is so easy and flexible to analyze anything in any way that you will be developing your own, unique optimization strategies in no time! Negative keyword discoverer – Stop wasting money on irrelevant clicks! Improve your click-through rates and quality scores! Discover those search keywords and partial phrases which never convert and specify them as negative keywords in your PPC campaigns to eliminate worthless clicks on your ads. Easy to customize and extend. Phrase match and exact match optimizer – Reduce your cost-per-conversion by moving from broad match to phrase match and exact match! This report identifies those phrases and exact match searches which brought the most conversions, so that you can optimize your campaigns to use the less competitive phrase match and exact match modes. Easy to customize and extend. Ad content optimizer – Increase click-throughs on your ads by determining which individual ad lines and combinations deliver the highest click-throughs and conversions. This report helps you methodically analyze all the messages in your ads to determine the most effective ones, alone and in combination with others. Easy to customize and extend. Easy multi-dimensional analysis –Drill down, slice and dice and uncover new strategies from within your data! Easily compare both keywords performance and ads performance over time and in different geographies. Compare the performance of campaigns in different time periods. Cross-reference sales volumes with particular campaigns, keywords, ads, etc. Easy to customize and extend. These sample reports are provided to get you started with Sisense, and to understand the possibilities that Sisense puts at your fingertips. You will take your online marketing and online marketing KPIs to the next level by continuously creating new, original queries and analysis reports using Sisense’s visual, drag-and-drop tools. And when you discover how easy it is to mash up data from Google AdWords, Google Analytics, Yahoo Analytics, your CRM, your in-house operational databases, etc., you’ll wonder how you ever did online marketing without Sisense!